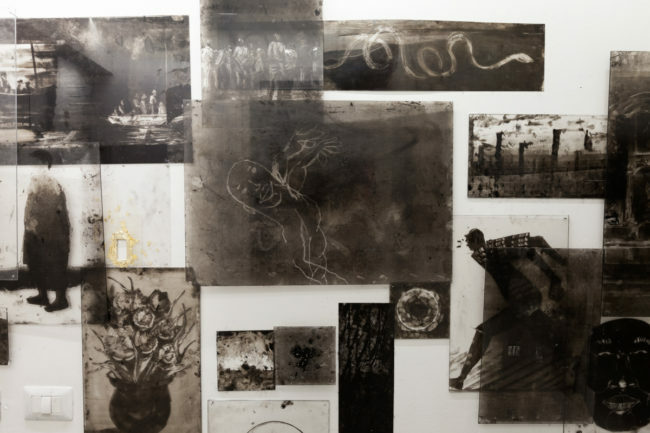 On 25 March 2017, Galleria Varsi presents “Colera”, an exhibition of monotypes created by Borondo, Run, Servadio and the Canemorto trio. 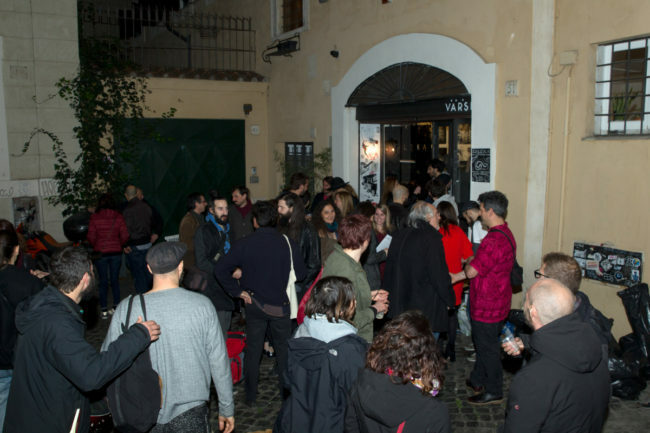 “Colera” derives from a spontaneous project started in 2015 when the six artists accidentally met in London and started getting together in Servadio’s workshop. 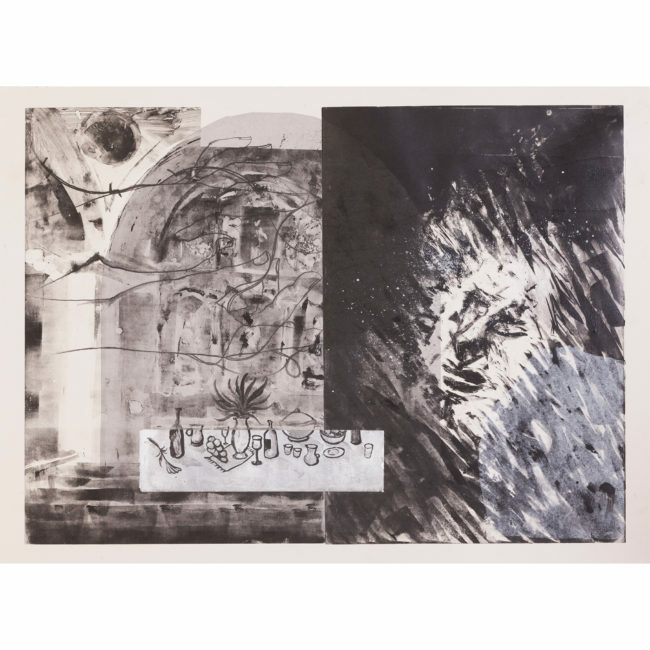 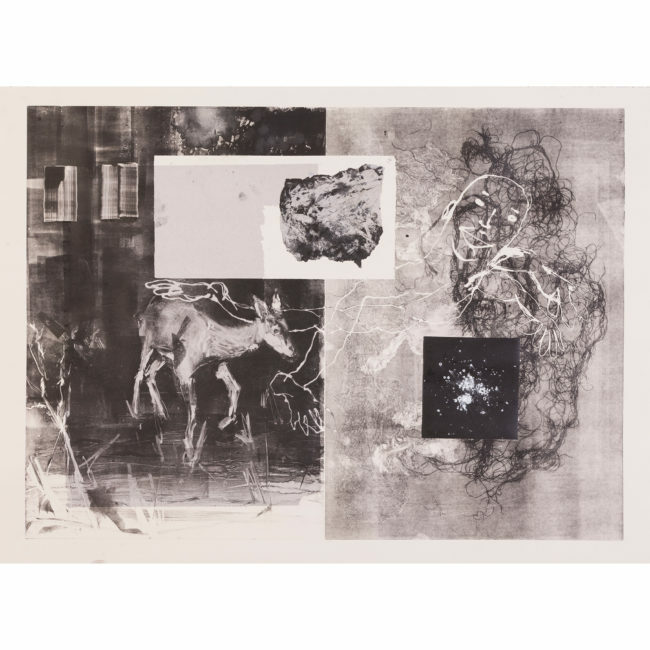 What united them in the Hackney Wick spaces were artistic affinity and a printing press, plus the shared will to investigate the possibilities of monotype. 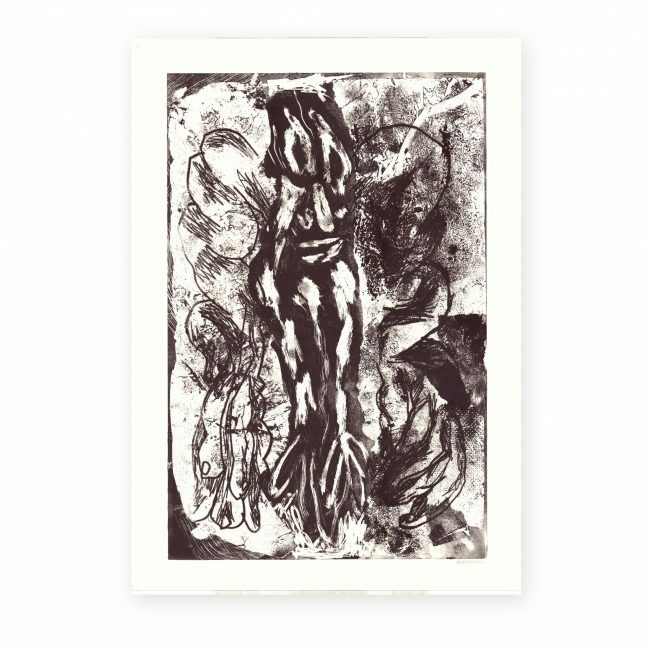 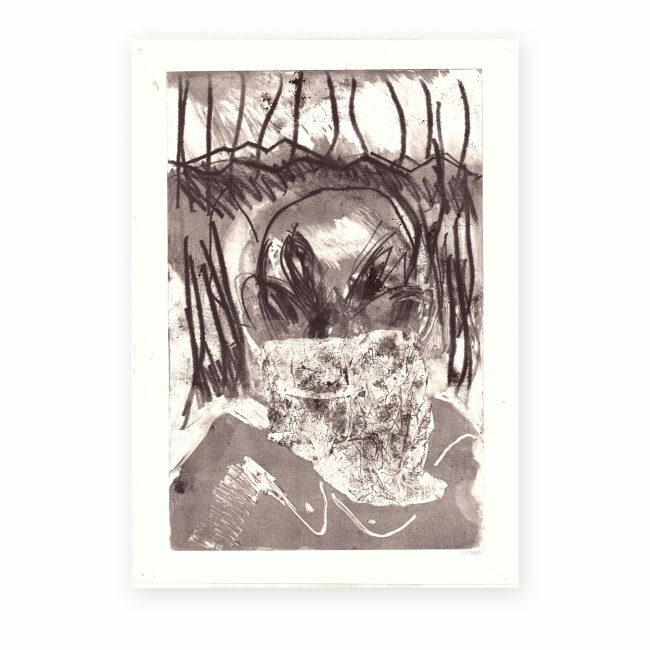 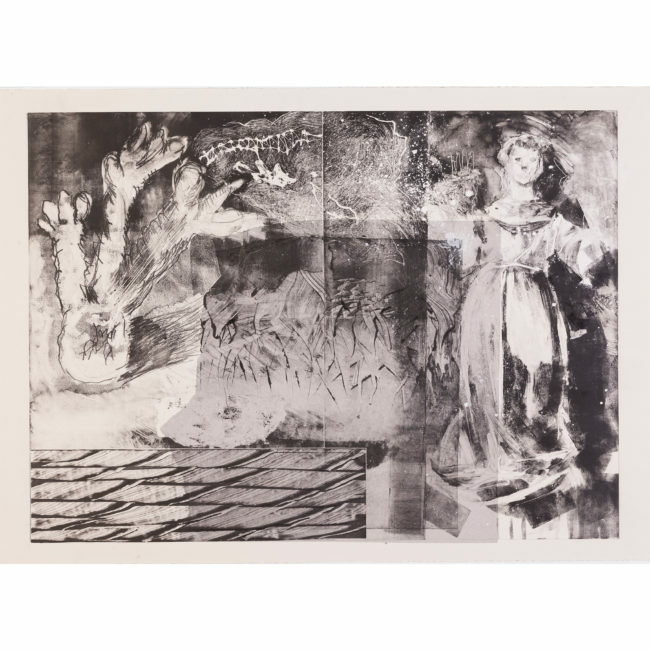 From the greek monos “one” and typos “impression”, monotype is a hybrid medium; the boundary between painting and printing that results in each work carries its “ghosts” and a matrix which is inexorably destined to disappear. 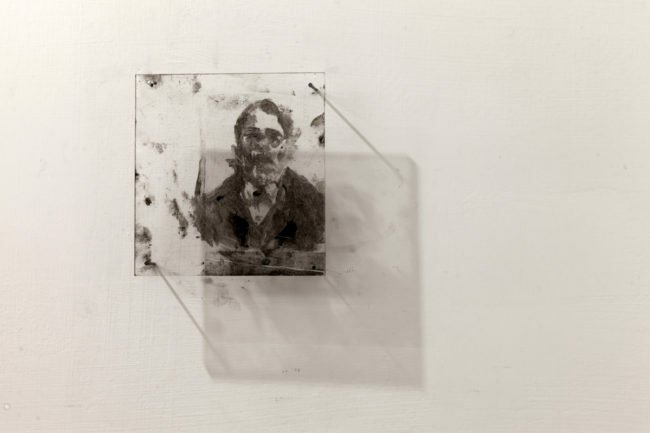 A monotype is achieved by the pressure of a plate (initially metal and later wood, glass and plexiglas) painted in ink or oil paint on paper. 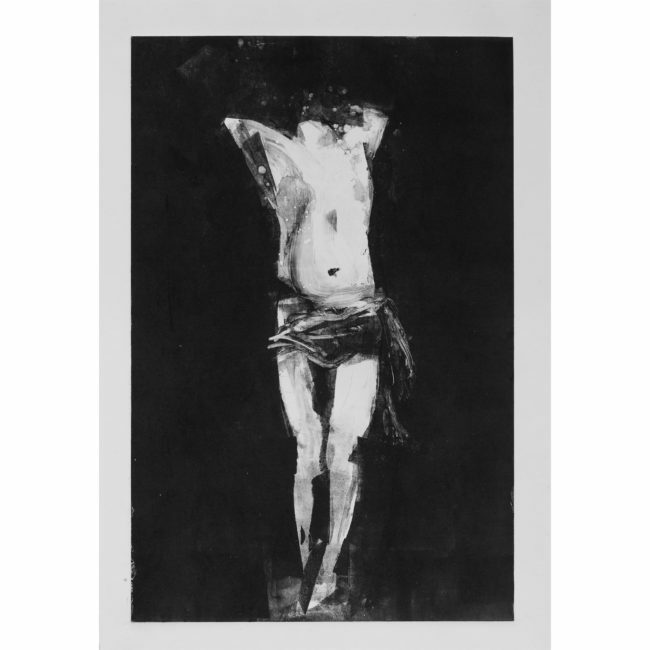 The image, first designed reversed, is created by using paint brushes, drills, rollers and unusual original instruments. 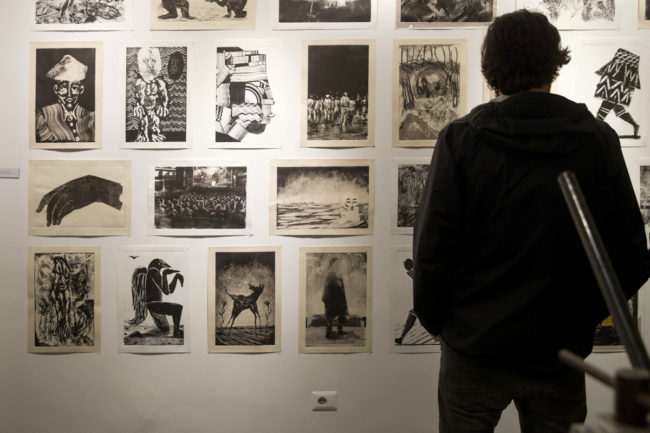 It is an intellectual and sensory art form whose regulative principles admit the freedom of different media and the full artistic expression of those who work on it. 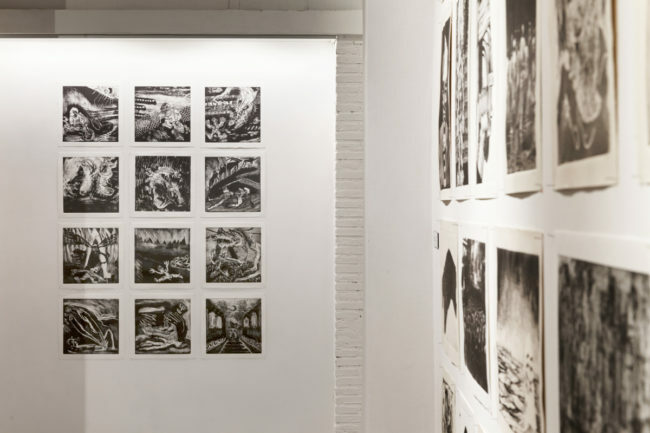 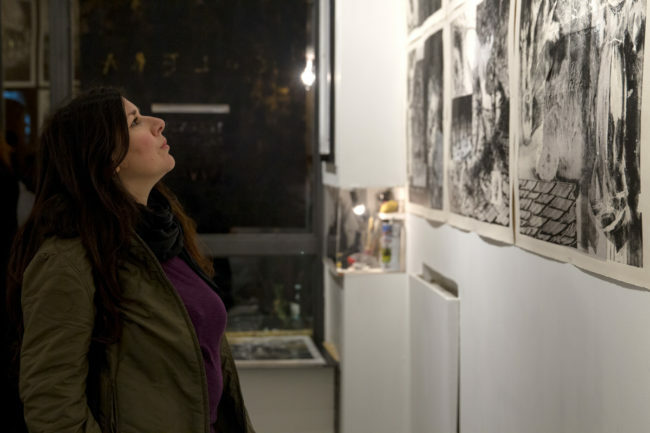 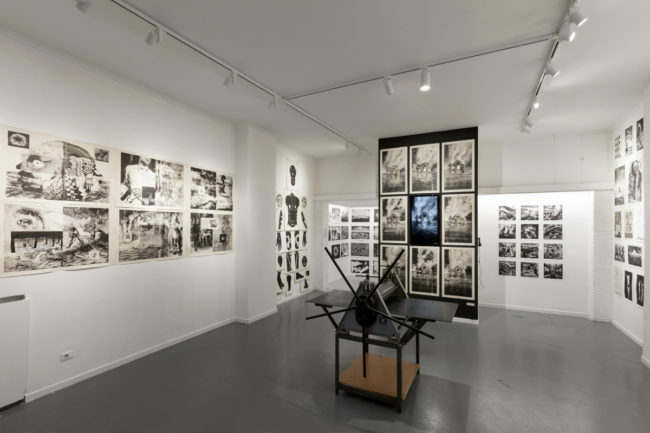 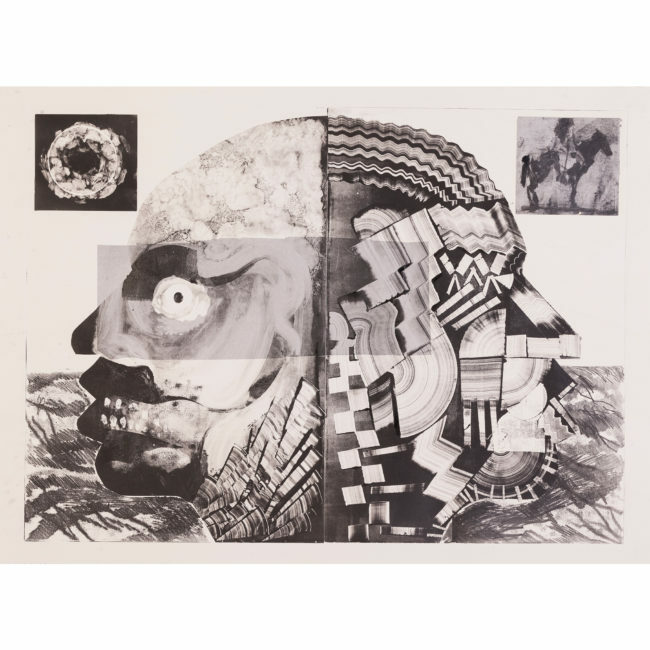 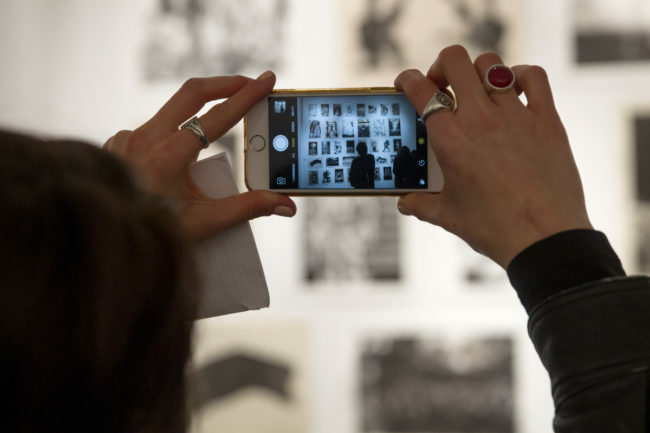 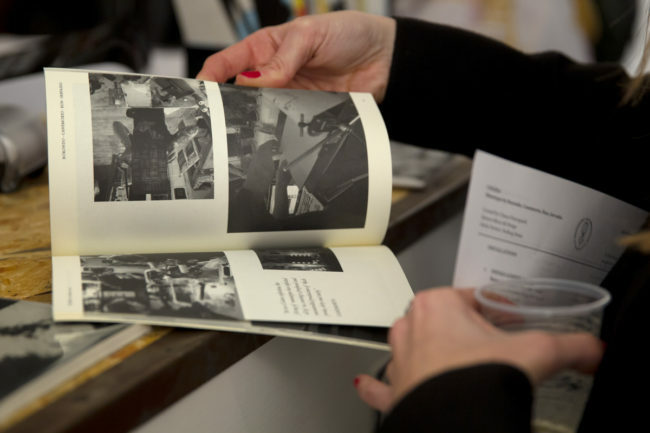 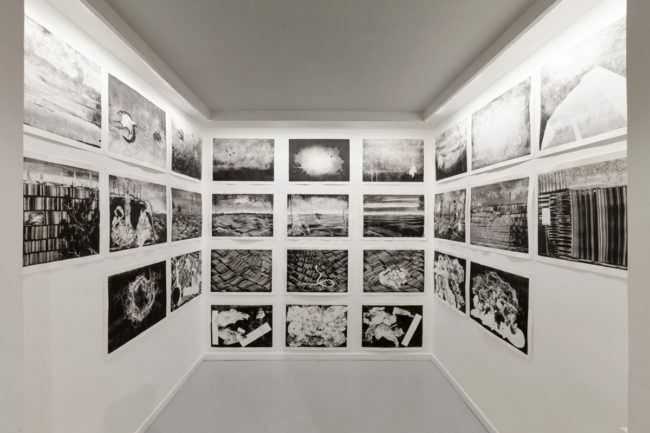 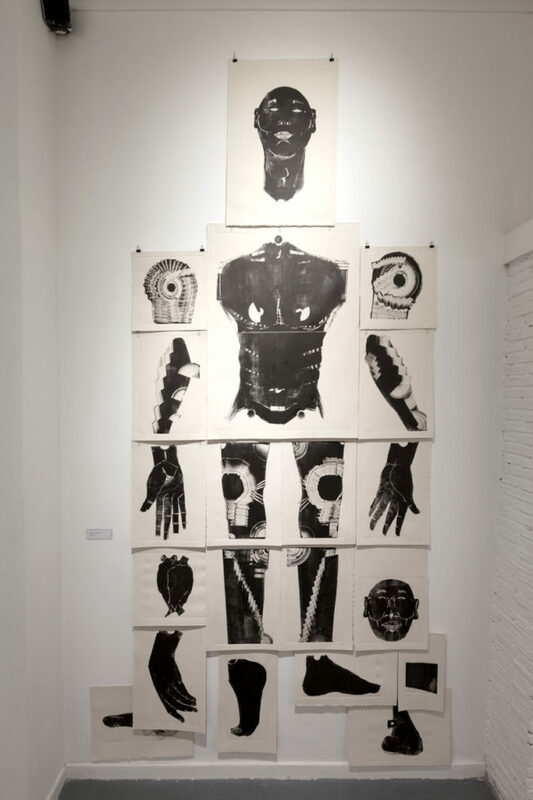 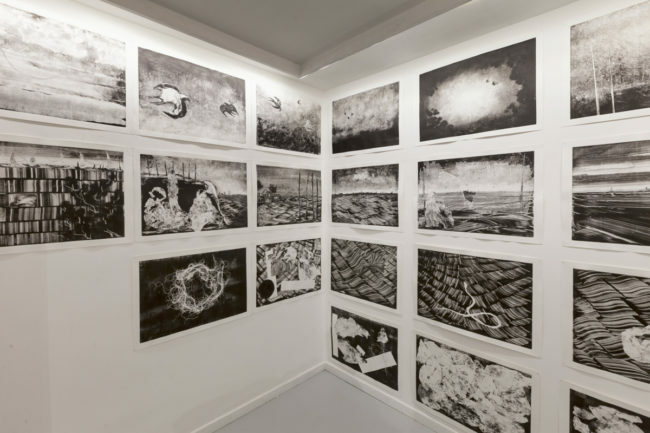 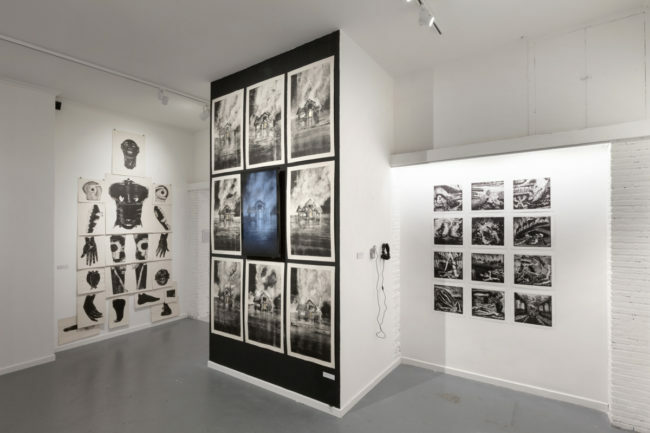 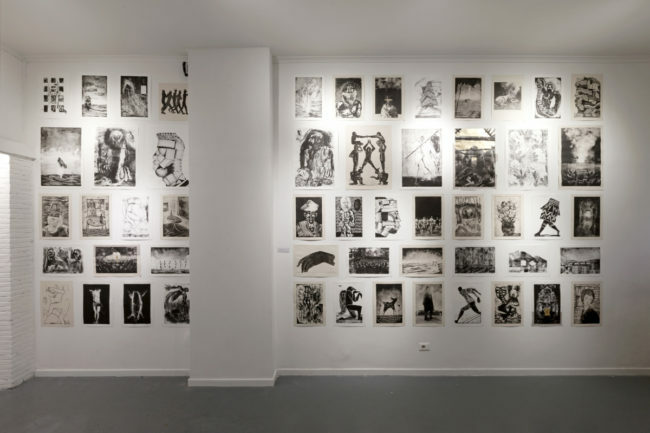 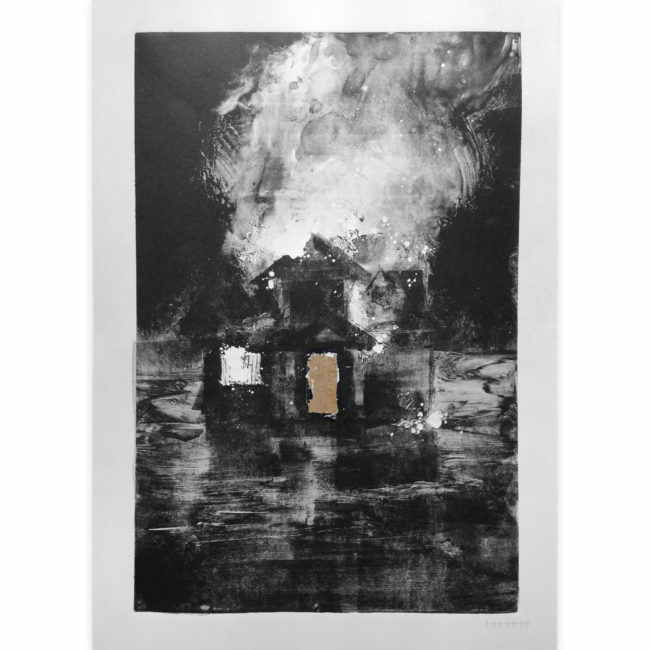 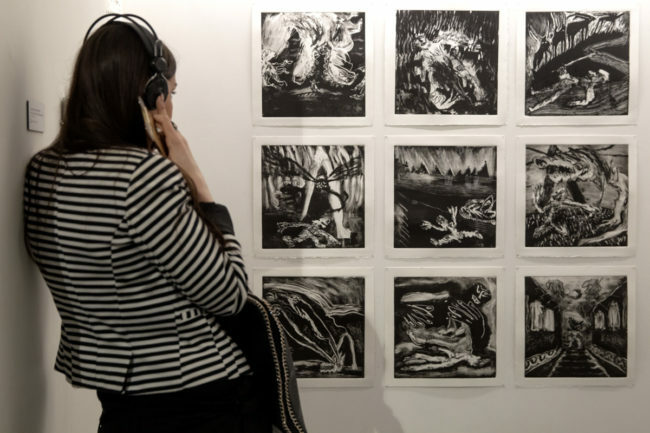 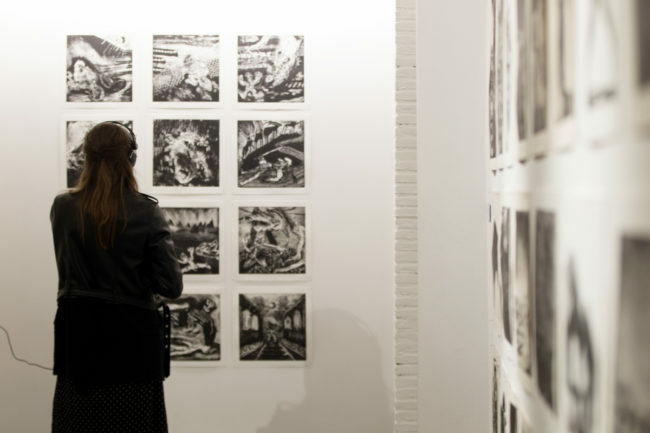 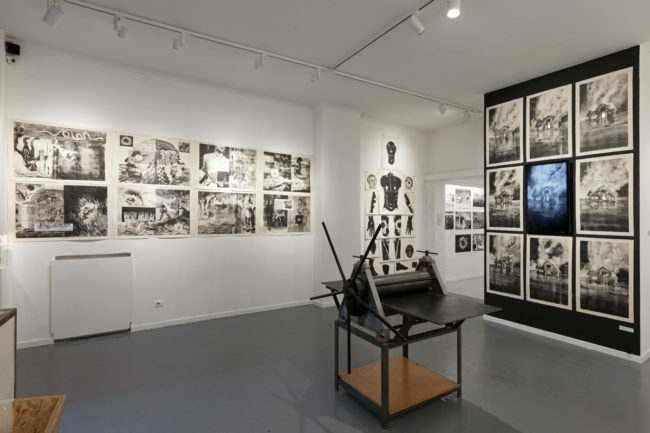 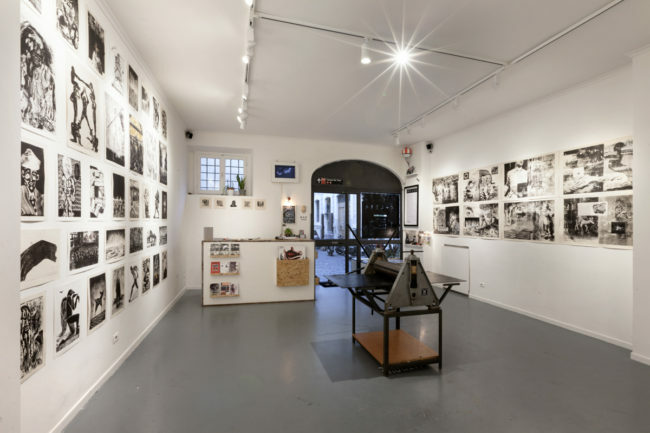 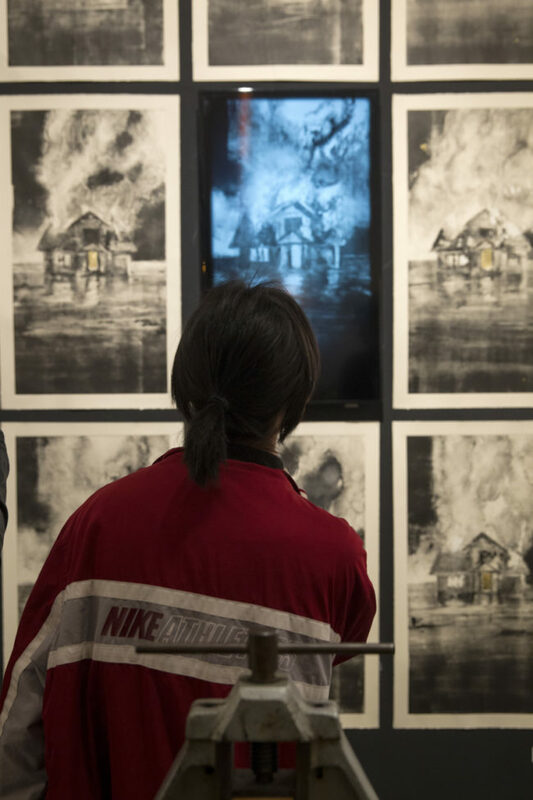 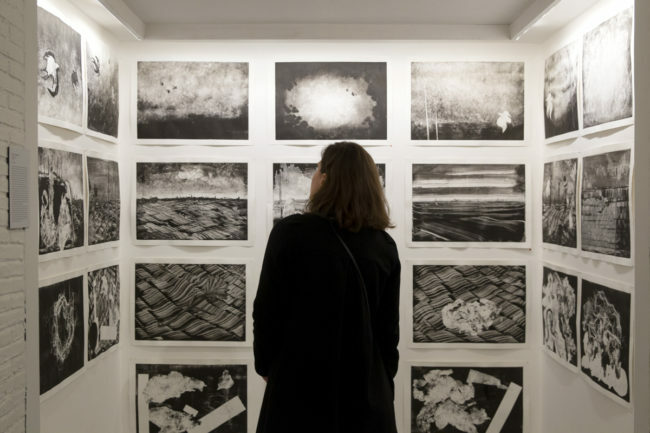 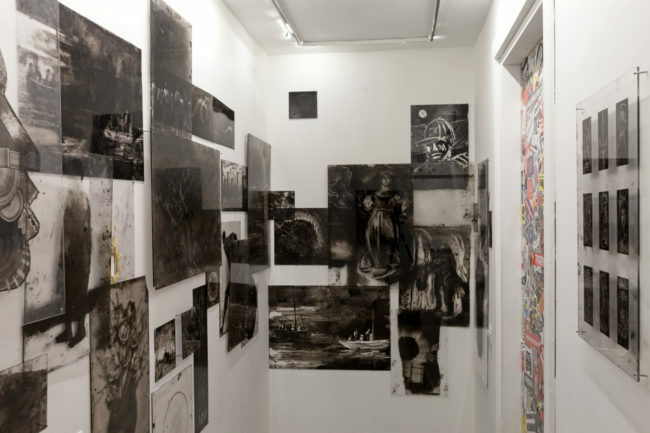 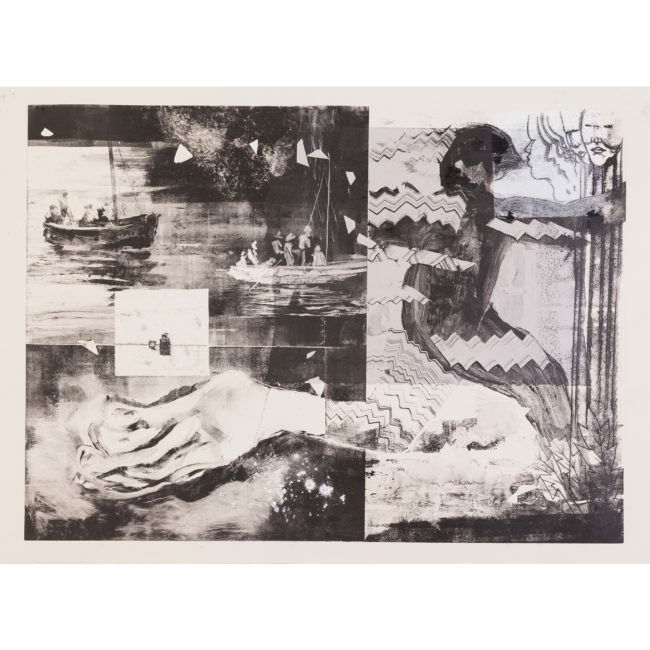 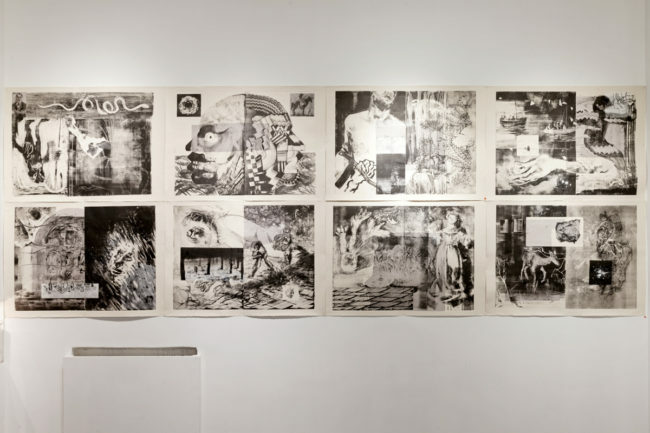 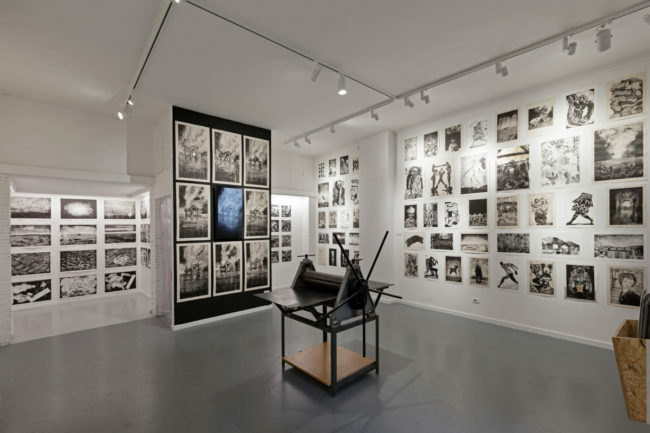 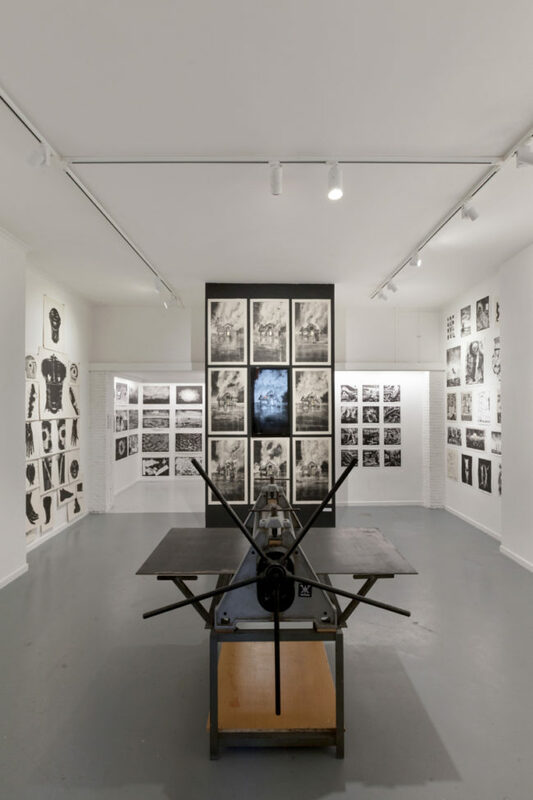 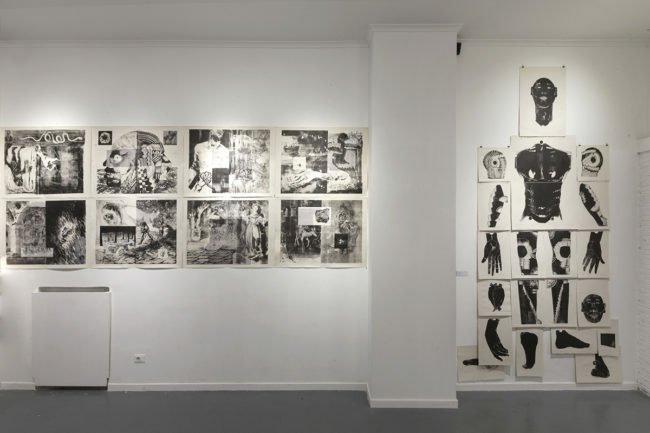 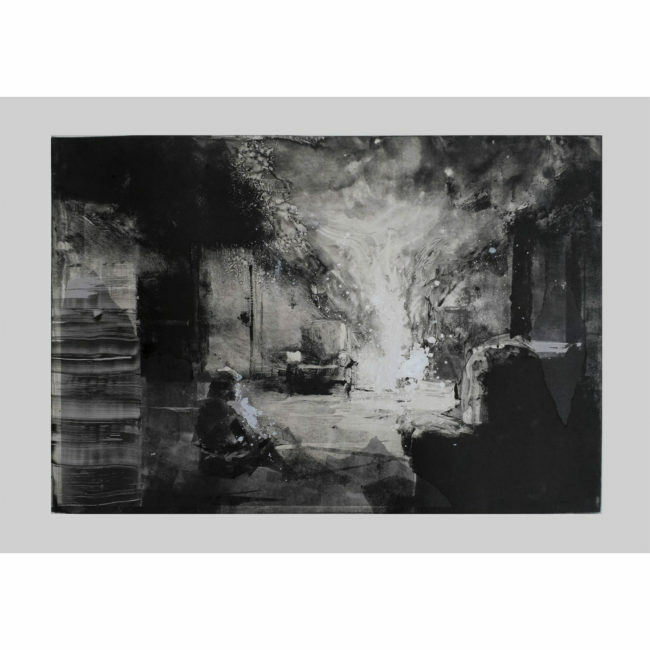 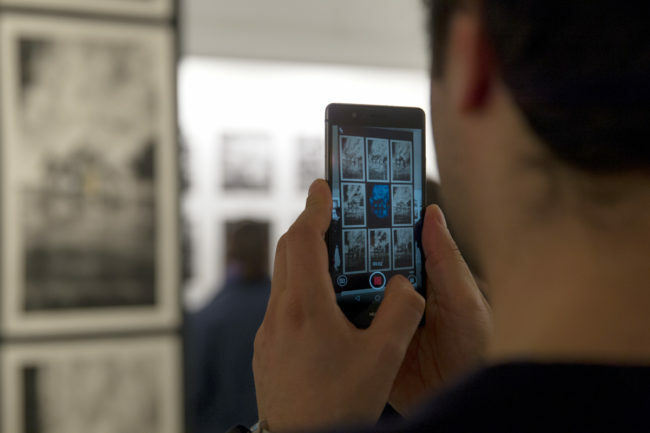 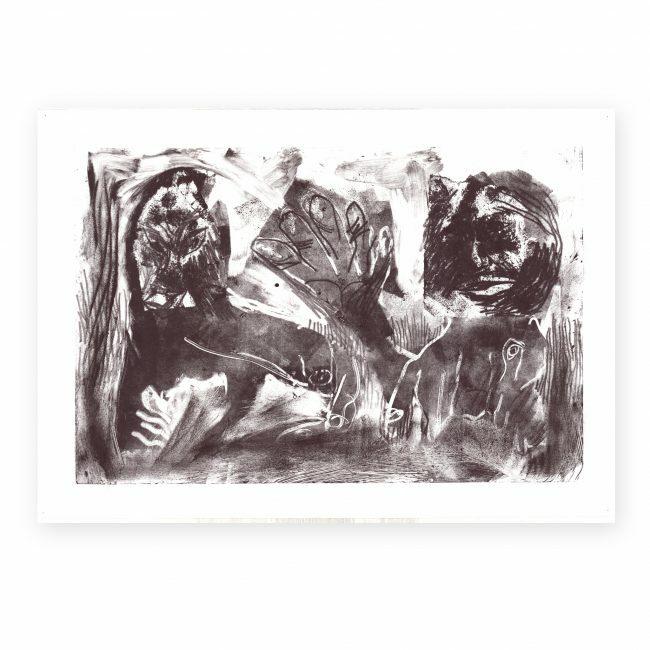 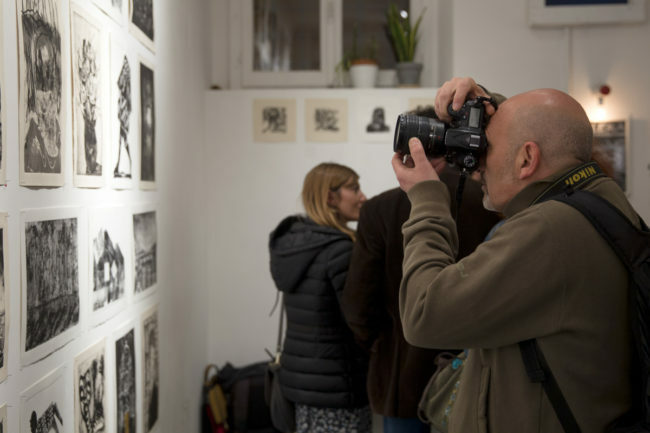 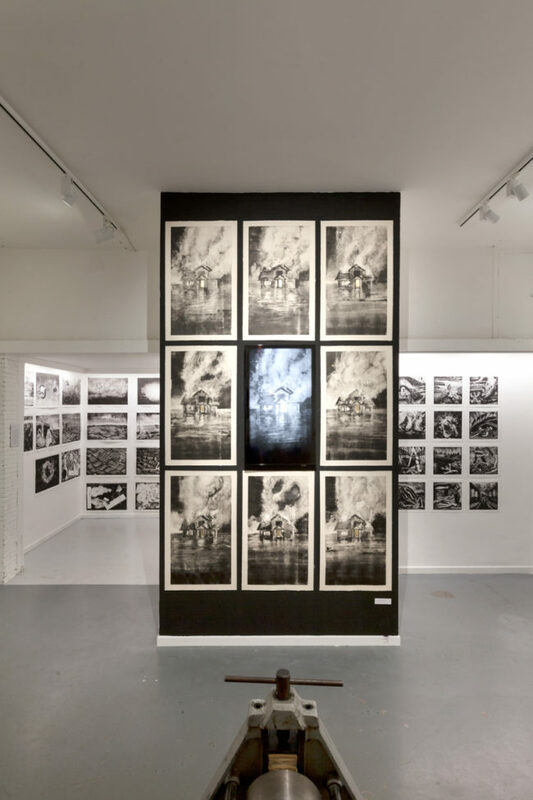 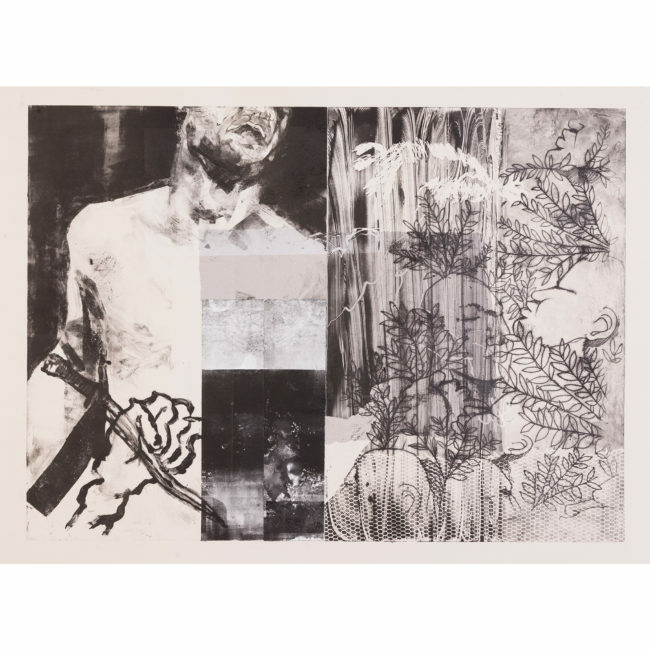 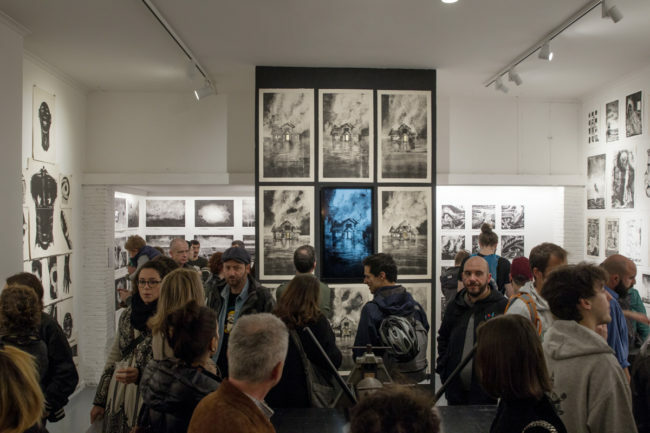 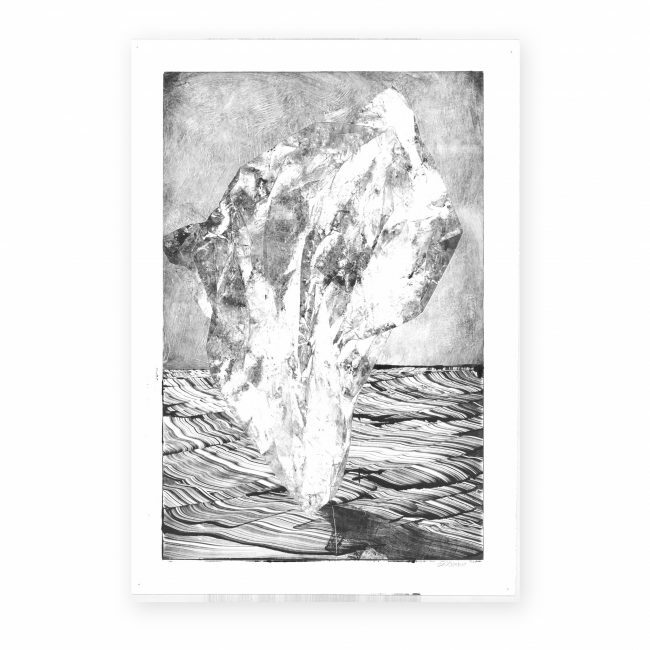 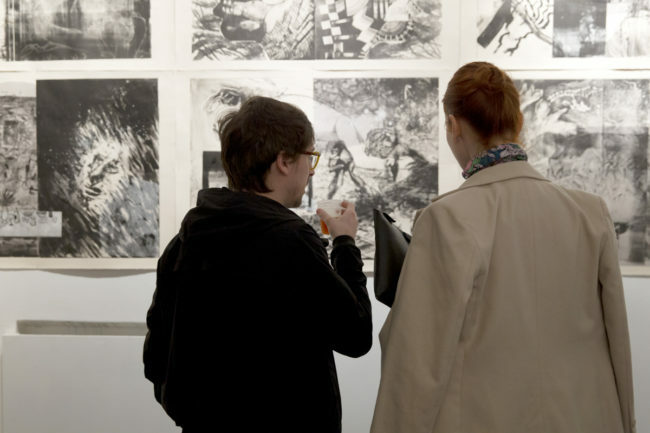 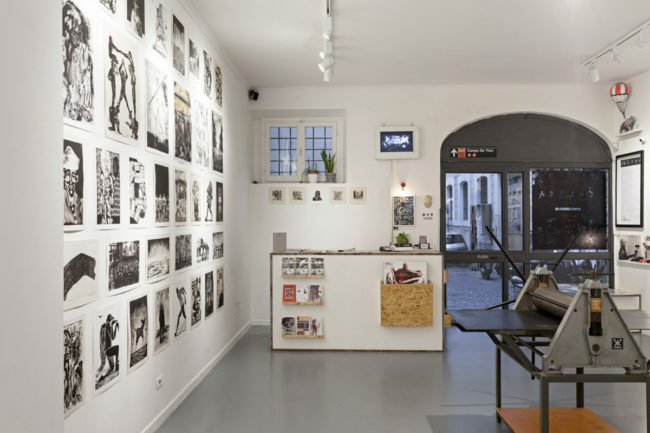 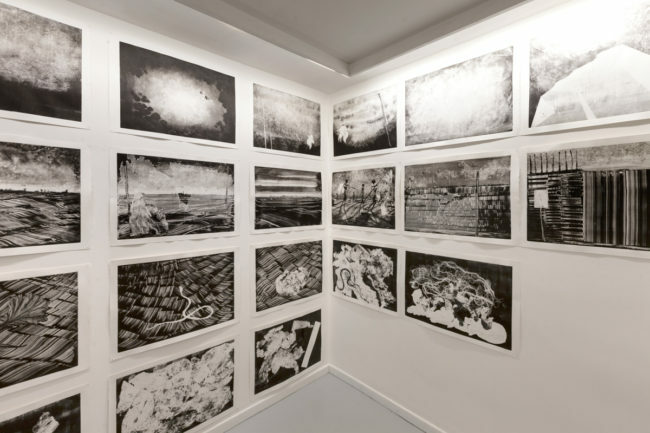 The outcome of Borondo, Canemorto, Run and Servadio’s London experience was an enormous amount of unpublished monotypes and the will to pursue what was accomplished to generate a new production of works. 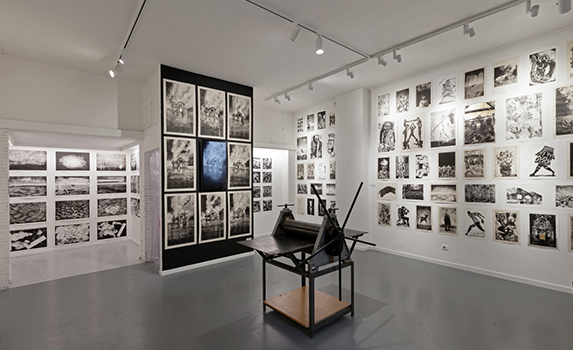 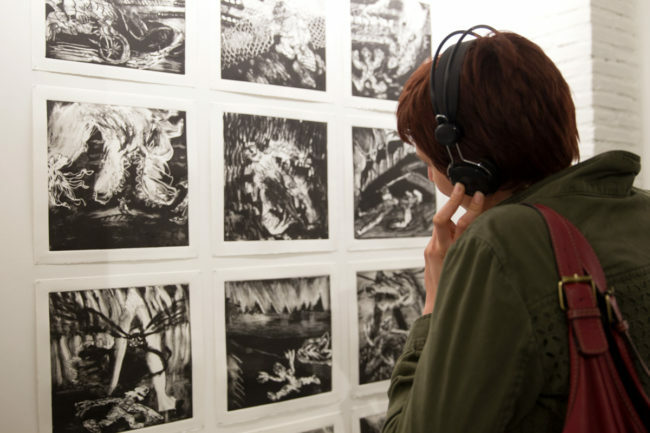 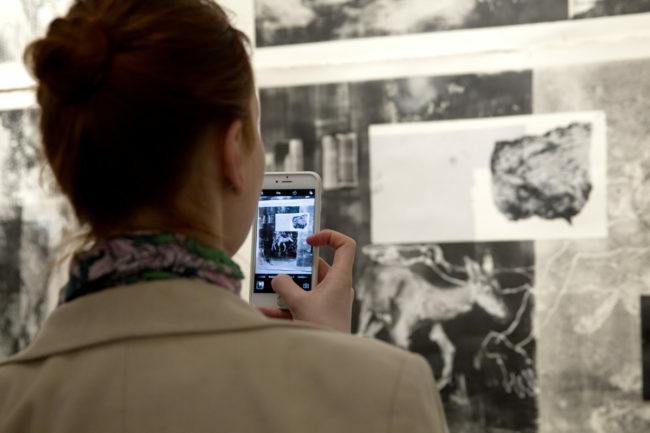 The title chosen for the exhibition reveals the atmosphere of the printing sessions: “Those days my workshop looked like it was snowing sheets,” says Servadio. 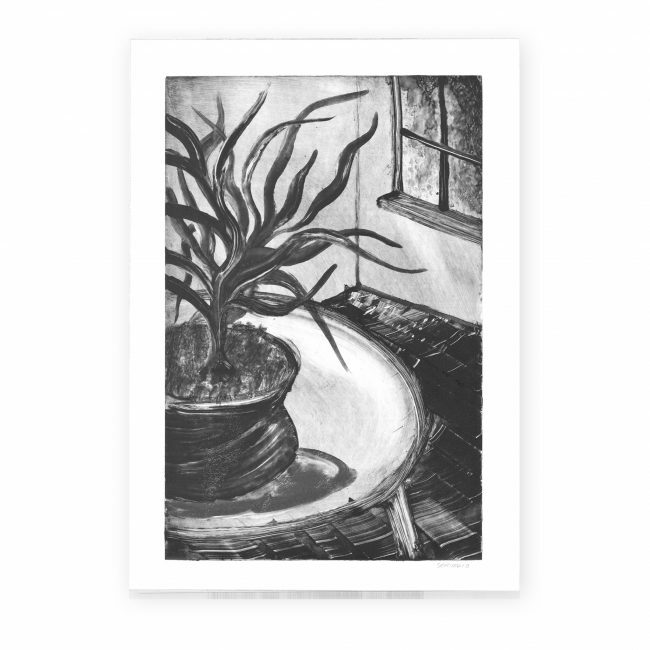 Floor and bodies were tinged with murky matter, ink was everywhere. 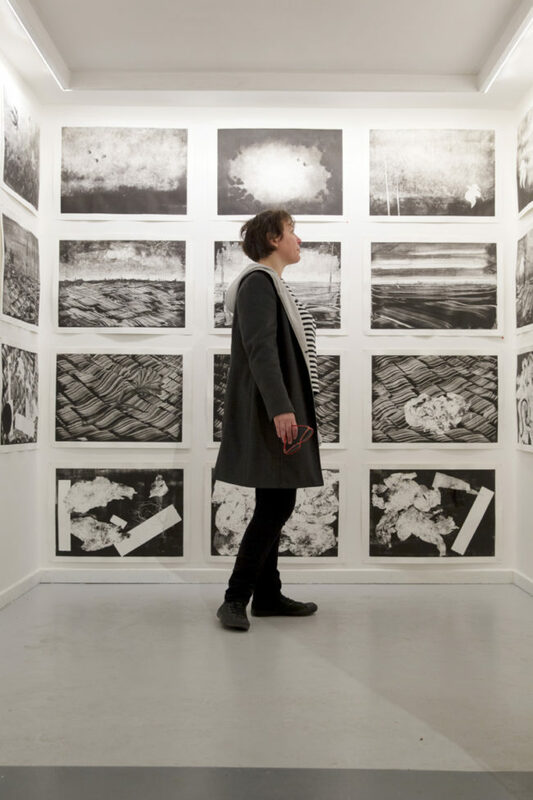 Printing was nonstop, intentions were born and died on paper in an attempt to discover formal solutions that could satisfy the artists there and stimulate other endless printing series. 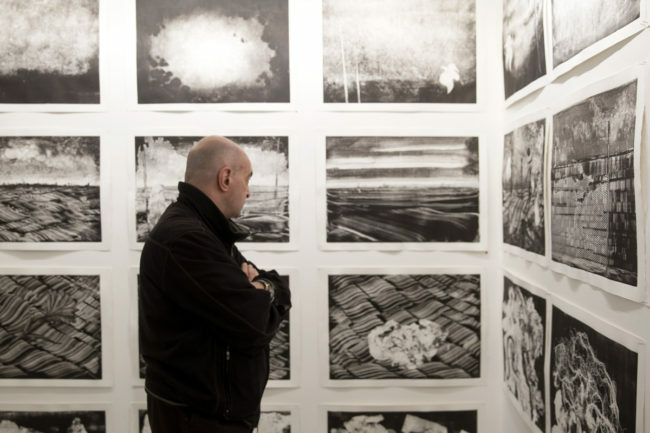 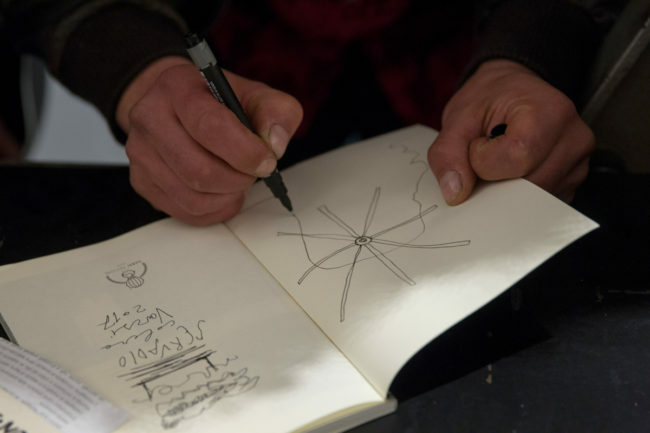 The six artists are meeting together again at the same time and in the same place. 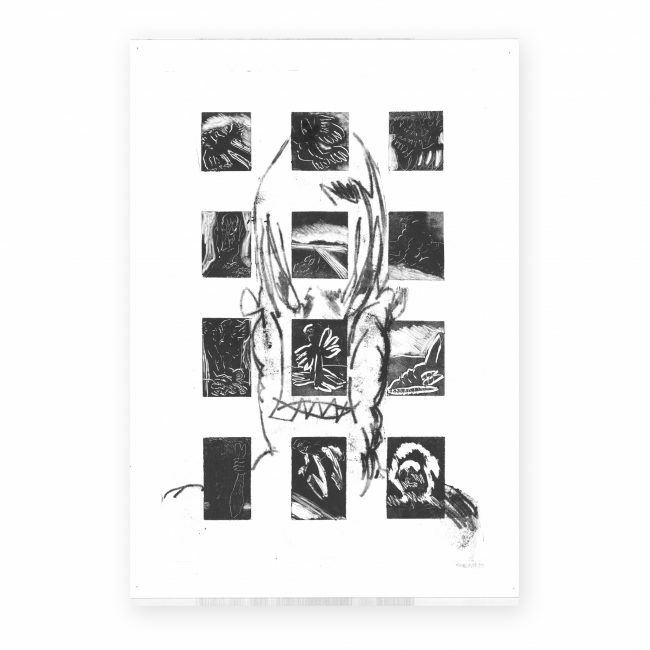 Their thoughts and expressions will merge to create new instances. 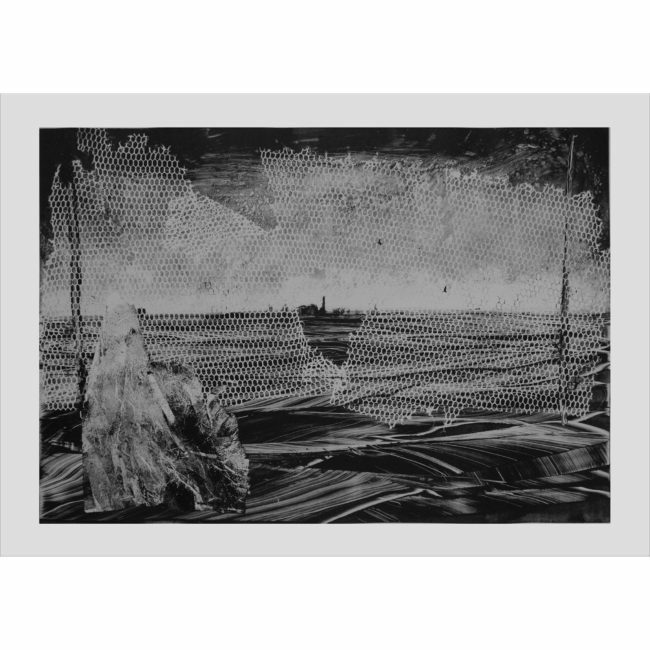 It will snow again. 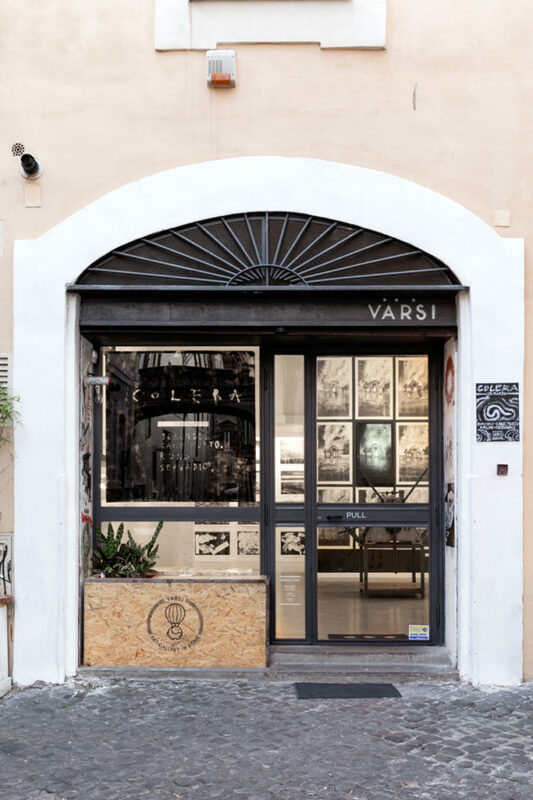 At Galleria Varsi they will be working closely together for two weeks, generating over two hundred monotypes that will be deposited on the walls, like a second skin. 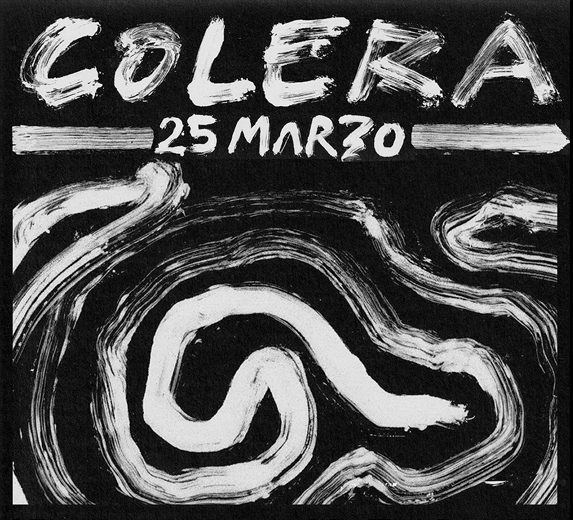 “Colera” is a black project, dense and dirty, immediate and stubborn, insistent and obsessive, intrusive and viral. 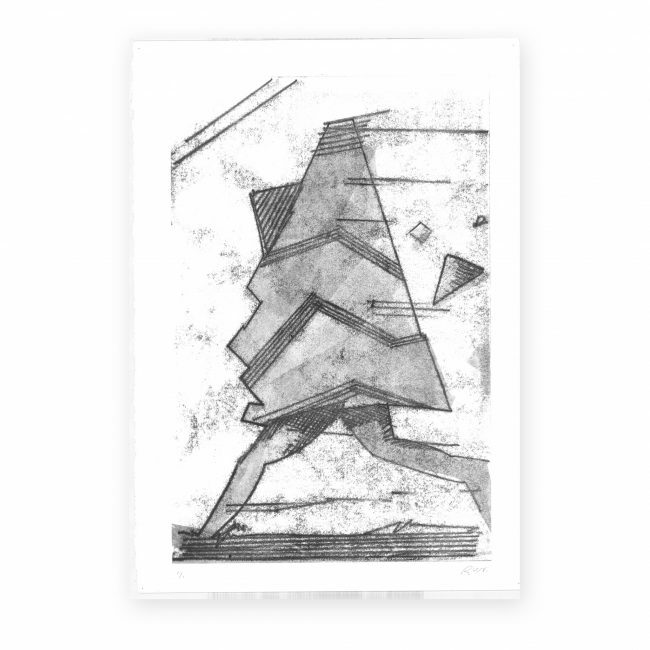 It has an urgency of its own: that of generating and continuing to occupy space, and of contaminating it with intentions and actions to be shared and felt.